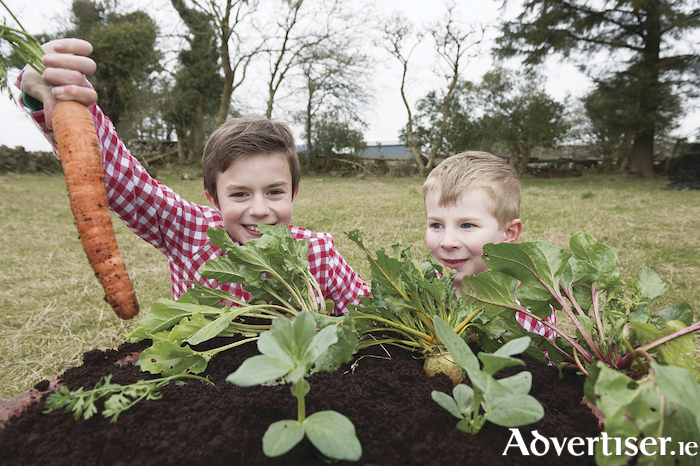 Pictured on Willie Fahy's farm in Athenry were Miguel Ruiz Tully, Castlegar, and Luke Coyne, Carnmore. Photo: Andrew Downes, XPOSURE. A free family event will be held in Galway tomorrow (Friday ) to officially launch the flagship programme for Galway, West of Ireland European Region of Gastronomy (ERoG ) 2018. The event will take place at the Spanish Arch from 5pm. The date marks almost two years since Galway, West of Ireland, won the illustrious ERoG 2018 designation on St Patrick’s Day 2016. A community opening ceremony will be followed by a family céilí, and the celebration will also showcase local food producers to spotlight the region’s innovative, dynamic, food sector and rich food heritage. The celebration promises to be a fun, informative, and lively knees-up with something for everyone. “The purpose of the event is to give the people of Galway city and county the opportunity to come together and celebrate the designation,” said Elaine Donohue, programme coordinator for Galway, West of Ireland ERoG 2018. “We will welcome specially invited guests, namely Dr Diane Dodd of the Institute of Gastronomy, Culture, Arts, and Tourism, which manages the designation, and Anja Van Hout from Noord Brabant in the Netherlands, which is the only other recipient of the ERoG designation for 2018. The wide-ranging and vibrant ERoG 2018 programme will feature events, festivals, projects, and initiatives that cross the boundaries of food, culture, tourism and other sectors to enhance Galway’s food culture and create a lasting impact. The theme of the designation is ‘From The Ground Up, Feeding Our Future’. The Galway, West of Ireland ERoG 2018 designation is being led by Galway County Council, Galway City Council, Galway Mayo Institute of Technology, and Teagasc, and it is being supported by a range of both national and local stakeholders and communities. The full Galway ERoG 2018 programme will be available on the official website www.galwaygastronomy.ie and social media channels @gastronomy2018 each month.